Quepos, Costa Rica…once home to the Fierce Quepoa Indians! Quepos acquired its name from the Quepoa Indians, which derived from the Boruca tribes that migrated northward from Columbia towards the end of the first millinium. The great conquistador, Juan Vasquez de Coronado, declared the Quepoa Indians as the ¨most beautiful people seen in these indies¨. The Quepoa Indians were well respected as fierce fighters, and are said to have pilaged great quantities of gold from the Caribbean tribes of this country in their reign as relentless warriors. It is said that these tribes lived the majority of the year near the foothills of the Naranjo and Savegre Rivers for the purpose of more productive farming, while in the rainiest months they inhabited the coastal hills of Manuel Antonio, concentrating around Quepos Point. The earliest recorded European presence in Manuel Antonio dates back to around 5 years after the famous Spanish explorer Balboa discovered the Pacific Ocean in the early 1500´s. Explorer Juan Ponce de Leon, who would later be credited with discovering Florida in his quest to find the fountain of youth, arrived to the shores of Costa Rica, and more specifically the Manuel Antonio area in the year 1519. Upon his arrival to our shores, his flotella encountered a large presence of fearsome taunting Quepoa Indian Warriors lining the beach, and wisely declined to make landfall. To this day, there continues a legend that a hidden treasure of some seven hundred tons of gold, silver, pearls, emeralds and other jewels exists somewhere in the territories that the Quepoa Indians occupied. Though this has never been confirmed, and obviously the treasure has never been discovered, infamous English privateer John Clipperton spent a good part of the late 1600´s exploring the area and befriending the Quepoa Tribes in his attempts to claim this immense fortune. Upon his death in 1722, Clipperton still believed the largest world treasure existed in our area, but was unsuccessful in his quest to claim it. In the year 1746, after many years of Spanish rebellions, disease brought on by the European settlers, and warfare between rivaling Indian Groups, the Quepoa tribe was forced into extinction. The whereabouts of the legendary treasure, estimated to be worth billions of dollars at today’s currency still remains a mystery! The actual town of Quepos first came to modern prominence as a busy shipping port for exporting bananas for the United Fruit Company. After years of devastating disease devastating the banana industry, this crop was scrapped and the agriculture fields were converted to the 40,000 plus hectares of African Palm trees that you see today. Prized for the diverse properties the oil produces, African Palm oil is now used as bio-fuel, in creams & cosmetics, soaps, margarines, as well as cooking and industrial oils. Although this crop continues to be a major economic force in our area, it helped fuel the decline of Quepos as a major shipping port, as the smaller fruit is much easier to transport and refine locally. Surprisingly, even as late as the 1950´s basic communication between Quepos and the rest of the country was a challenge. Roads were almost non-existent, and passage by mule, donkey, horse or oxen cart was for many years the norm for the locals that lived in the area. 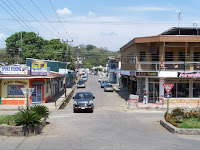 In the 1940´s the president of Costa Rica, Rafael Angel Calderon declared Quepos and Parrita districts of Puntarenas, and it was at that time that they started work on a major road to San Jose, but that took many years to complete. There was a small railroad between Quepos and Parrita, but it was not widely used for the public and more often at low tide airplanes would land on the beach in front of the main street in front of what now stands as our sea wall. This is how they accommodated the first tourists, which arrived mostly during the dry months of January, February and March, and whom at that time were almost exclusively Costa Rican. It was not until the 70´s that the African Palm industry prospered enough that highways became an absolute necessity, and the first telephone arrived to the Quepos area. Quepos, home to numerous hotels, restaurants and other tourist operations, it serves as the gateway to Manuel Antonio National Park and it’s even wider variety of hotels, is now better known for it´s World Class Sportfishing, claiming some 17 IGFA records! Tico Tarzan….a True Costa Rican Adventure!! Imagine upon moving to a foreign country one of the first persons you meet is fondly known by all as ¨Tico Tarzan¨. Officially named Gilberto Shedden, this 50 year old Costa Rica native fisherman, better known to his friends as “Chito”, has gained this nickname by training and playing with his good friend “Pocho”. I know you’re thinking it’s a cute little monkey or chimp, thus the title ¨Tarzan¨, but you would be VERY mistaken. Pocho is Chito´s fully grown, pet American Crocodile! Rolling the large reptile on its back, pushing his head of razor sharp teeth under and above the water, as well as tenderly kissing Pocho right on the nose, this is no average Tarzan by any means! Even for Chito, who grew up in the jungles of Costa Rica, their games are much more than a planned tourist trap spectacle, it is a clear demonstration of an unusual friendship established over time between a normally dangerous crocodile and an anything but normal human who saw one of God’s creatures in need. The unusual friendship with Pocho began more than 17 years ago when Chito found the then two meter American Crocodile adrift in the Parismina River. Located deep in the many miles of winding and remote natural and artificial canals of Tortuguero on the Caribbean coast of Costa Rica, the hapless crocodile had received a bullet in the head and was in bad shape and unlikely to live. 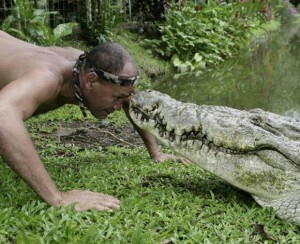 Chito, a character that truly defies description, who is well known for the soft spot in his heart for any and all animals, took the injured crocodile into his humble home and nursed him back to health over the next several months. Feeding him small pieces of chicken and gently stroking him and doctoring his wounds, Pocho was amazingly receptive to the attention and over the next several months a special bond was created between the two. I’ll never forget the first time we went to Chito´s house to have a few ¨cervezas¨ and Chito wanted to introduce us to his new friend. With Chito, you never knew what to expect, but nonetheless, I was a bit taken aback when he opened a door and there was Pocho! As a ¨newbie¨ to Costa Rica and this small Caribbean Village on the Atlantic side of Costa Rica, I kept thinking to myself, ¨Can this be normal?¨ Happily, it is not, but as one gets to know the eccentric Chito, it just really did not seem that odd either as he always had a menagerie of wild animals that he was in the process of nursing back from the dead, with the hope of returning them to the wild! Living in such a remote location, and being of humble means, a veterinarian was not in the cards for Chito or Pocho, so the entire care and recuperation of the crocodile fell on Chito himself. When it was thought Pocho had recovered sufficiently to survive on his own once again, Chito left his beloved Crocodile pet in a small nearby pond to carry out the many years he would hopefully have left in his life. But even to Chito´s surprise, the reptile chose to leave the water, following Chito back to his house and instead choosing to live in the canal in front of Chito´s property. Realizing that Pocho and he had apparently cemented a unique new friendship, daily visits and swimming sessions became part of their incredible bonding process and a source of much entertainment for the locals. Much to the dismay of family and friends, Chito continued to swim and play with the rapidly growing crocodile, teaching him a series of commands, including death rolls, tail slaps, back floats, belly rubs, swims and skims and even closing his eyes on cue! as word spread of the crazy antics of Chito and Pocho, the entrepreneurial light bulb went off in Chito´s head. People began to naturally seek these two characters in the remote village of Barra de Parismina to see for themselves this incredible phenomenon, but this proved difficult due to the remote location of this small village. Now relocated to a small lake on Chito´s other farm on the outskirts of the town of Siquirres, this unlikely duo attracts multitudes of people, both National and International travelers weekly to experience for themselves the ¨Tico Tarzan Show¨. Dressed only in well worn shorts and his customary sweat band in place on his forehead, Chito enters the water with absolutely no safety equipment or even ambulance drivers on call, where he leads Pocho, and at times Pocho leads Chito, through a series of acrobatic stunts and amazing tricks, including the lifting and slapping of his enormous tail with great force on the water, as visitors look on at the gigantic reptile in amazement from the safety of the railing of the ¨typical¨ style lakeside restaurant or ¨soda¨. It is estimated that Pocho is around 50 years old, weighs approximately 900 pounds and measures in the area of 4.5 meters. The American Crocodile is a species of crocodilian found primarily in Central America. It is the most widespread of the four species of crocodiles found on the entire American Continent. Populations occur from the Atlantic and Pacific coasts of southern Mexico to South America and stretching as far as Peru and even Venezuela. There is a remnant population of about 2000 in Florida, United States. The habitat of the American crocodile consists largely of coastal areas, though they are quite common in canals and other inlets, so caution should be exercised when in these areas. The American crocodile is larger than some other crocodile species, with some males reaching lengths of 6.1 metres (20 ft) in Central and South America. Full grown adult males of this species have no natural predators and are capable of preying on virtually any animal unfortunate enough to be at the waters edge. It is estimated they can live up to 70 years in captivity, so Chito and Pocho may continue to entertain us for many years to come, barring any accidents that is!